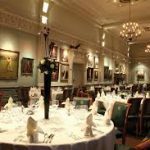 The annual Johnners Dinner took place on 7 November 2016 in the Long Room at Lord’s. This year we celebrated the 21st anniversary of the Brian Johnston Memorial Trust and the evening was sold out, raising more than £13,000 towards the Brian Johnston cricket scholarships. Many thanks to our vice-patron Sir John Major for his brilliant speech, and to Chris Cowdrey, Peter Such, and everyone from the Lord’s Taverners who helped to make the dinner such a great success. We look forward to seeing you next year!